Coral View Villas is a small, charming genuine Bali resort situated right on a sandy beach in the quiet, rural village of Amed. 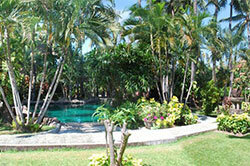 The mature, lush, palm tree-filled gardens that line the miniature waterfall and sparkling blue pool are extraordinary. 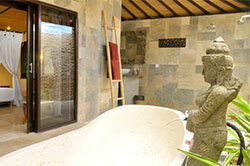 The entire hotel is completely decorated in typical Balinese style, ornate carvings and classic statues. 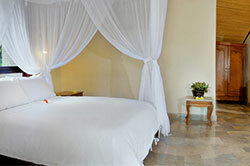 Built in 1996 and renovated in 2011, the hotel has 19 basic and clean Deluxe and Suite rooms. 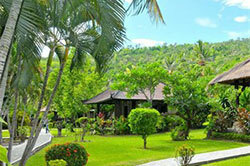 The hotel has a relaxed, traditional Bali restaurant and bar with great ocean views. There is a high-quality dive center nearby and fantastic snorkeling straight from the beach in front of the hotel.